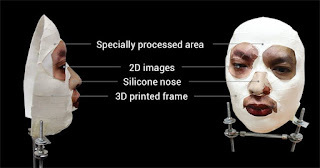 Using a composite 3D-printed mask, a team of Vietnamese researchers claim to have fooled Apple's Face IDauthentication system seen in the "super-premium" iPhone X, stressing that face recognition is "not mature enough" to guarantee security for smartphones. At iPhone X launch event, Apple's Senior Vice President Phil Schiller had claimed that Face ID can distinguish between a real human face and a mask, thanks to its artificial intelligence (AI). Using a 3D printer, the team at Vietnamese security firm Bkav created a mask that cost them $150 (roughly Rs. 9,810) and is claimed to fool Face ID. In 2008, Bkav claims it was the first company in the world to show that face recognition was not an effective security measure for laptops when Toshiba, Lenovo, and Asus used this technology for their products. Apple's Face ID technology uses a TrueDepth camera system made up of a dot projector, infrared camera, and flood illuminator, and is powered by A11 Bionic to accurately map and recognise a face. According to the security firm, the recognition mechanism is not as strict as one thinks and Apple seems to rely too much on Face ID's AI. According to the security firm, if exploited, Face ID can create problems. "Potential targets shall not be regular users, but billionaires, leaders of major corporations, nation leaders, and agents like FBI need to understand the Face ID's issue [sic]."